Parents who need a side-by-side double but don’t want to push around a tank or something that won’t stand up to the rigors of carrying two children will prefer the Combi Cosmo Twin. This attractive stroller comes in several color schemes and you can keep the color vibrant because the seats have removable washable covers. One-hand, self-standing fold. Compact, lightweight, and portable. Padded, multi-position reclining seat. 5-point harness system with harness pads. Extra-large canopy with ventilation window. Two child cup holders and one child snack holder to share. Front wheel suspension with lockable swivel wheels. One-step brake. Parent cup holder. Some double strollers cannot fit through standard doorways because of their width, but the Combi Cosmo Twin can. It is considered a lightweight stroller weighing only 22¼ pounds and because it has only one handlebar, you can easily steer it one-handed. You’re going to love all the other benefits this Combi double stroller offers you and your children and by the time you finish reading this, you will understand it’s gotten high reviews from happy moms just like you. Let’s start with all the fabulous features. 5 What about the sun canopies? 9 Where can I buy the Combi Cosmo Twin? This Combi double stroller may weigh only 22¼ pounds, but that doesn’t mean it can’t take a heavyweight. 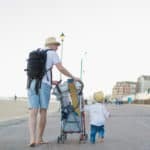 The Twin Sport can hold 90 pounds – up to 45 pounds on each side, so your kids can go through quite a bit of growing before retiring this stroller. Reflective accents on the carry strap and the stripe around the hood provide you with better visibility during low lit times of day or night. The brakes are individual set between the double wheels. 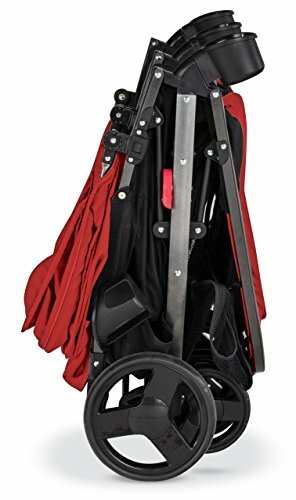 While I have not personally tested the wheels on this particular model, I have tested a Combi stroller before and their brakes are stiff and occasionally difficult to engage. I sometimes feel like I have to squeeze my toes in between the wheels where the brake is located. But once the brakes are on, the stroller is safely stopped. The Combi double stroller has a seat wide enough to accommodate a Combi Shuttle car seat to form a lightweight travel system, so you can start using this stroller at birth. If you don’t want to use a car seat you can still use this Combi baby stroller because the seat reclines flat and there’s an infant enclosure in each seat that you put up to provide your baby with more security. Simply pull out the attached material from underneath the seat’s cushion and drape it over the bumper bar. Zip it closed and secure the side tabs with the Velcro. To see a picture of how this looks, see my Combi Cabria review. 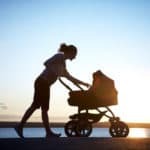 When the seat is fully reclined for your newborn, you will be pleased to see that the area behind the seat is not open air; instead, it is fully enclosed, attached to the top of the seat. The entire seat is enclosed and safe, like a cocoon, for your little one. The seats are padded with breathable mesh fabric on the bottom seat area, your child stays comfy yet cool enough on those hot summer days. The seats have removable padding for easy washing, a must-have for those spills and accidents. Reclining is done with a pulley-strap system that pulls down for a recline and backs up to incline into infinite positions. Easy to do with nobody in the seat, but the weight of your child on the seatback makes this a two-handed job. There’s lots of room to grow, too. When I reviewed the Cabria, I had a 2½-year-old girl riding in it. The seats are the same for the Cosmo twin, and you’re going to have lots of room for growth. Your child has a padded bumper bar with a snack cup on one side and a sippy cup/bottle holder on the other. When you don’t need the bumper bar, it’s easily removable. The fold can be a bit tricky at first, but once you get the hang of it, it becomes quite easy. Folds in half and then the sides fold inward, so it collapses twice, giving you lots more storage space. Most consumers mention the great fold. A parent from West Chester, OH, recently remarked on her 5-star review that this Combi double stroller fits in her Toyota Prius! I don’t think most double strollers can do that. Make sure that the front wheels are locked straight before folding to avoid damage. While locking the wheels straight is easy to do, I sometimes forget! The seats must be fully inclined and canopies pulled back before engaging the folding mechanism. Once folded, the Cosmo Twin stands on its own, and it is even lightweight enough to carry with the carrying strap. Or you can roll it behind you like luggage. This makes the stroller very popular for families who travel and want something lightweight and convenient. 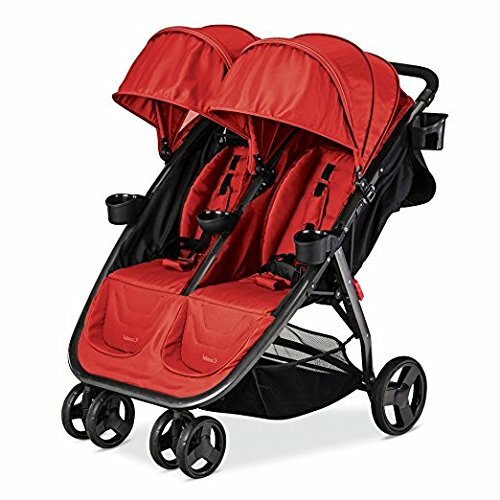 It is a bit more sturdy than a double umbrella stroller, especially if you’re using a car seat, but less bulky than other side-by-side twin strollers. What about the sun canopies? I love the canopies on the Cosmo Twin – there are two of them so you can individually adjust them to shade your children, which is very nice if they are at different ages and height; shading one would not shade the other and two canopies solve that problem. The panels on each extendable canopy offer plenty of coverage and each has a peek-a-boo window for keeping an eye on your passengers. There is plenty of spacious storage and I particularly like the two large pockets you see on the back of the sun canopies above. They end up fitting quite a few little things like your smartphone, small toys, or little snacks. The Velcro flap keeps everything inside. You see that you also get a bottle/cup holder on the side. It is not meant for hot drinks, though, and is only wide enough to hold standard water bottles. Moving a little lower, you get to the storage baskets. I like the stretchy mesh and easy access. You can fit a lot of stuff in there! 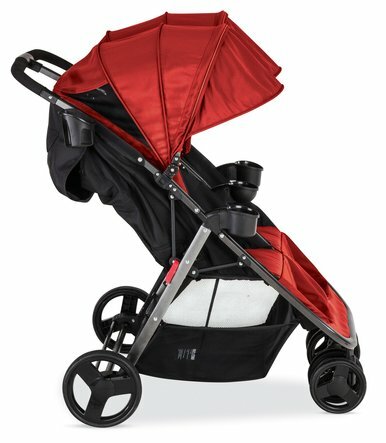 A mom from Vallejo, CA says in her review that the ample storage space is one of the best features of this stroller. The general consensus for the Combi Cosmo Twin is overwhelmingly positive and nearly unanimous very high ratings across various online retailers. Perhaps the most consistent compliments about it are the lightweight and compact size. Moms and Dads everywhere say that this Combi double stroller is easy to fold and is very small once it’s folded up all the way and they love how little space it takes in the back of their small to mid-sized vehicles. 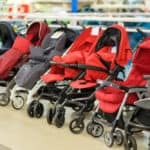 Just about all reviews say that the stroller fits through doorways, though it’s not going to be the best to take along clothes shopping amongst the racks. Parents also just love the extended canopies. A big complaint with the previous Combi Double stroller, the Twin Sport, it was the skimpy canopies. Combi listened and the canopies are MUCH improved with far more coverage. I have an updated Combi Cosmo Twin Consumer Reports rating as well. They give it a Very Good mark for ease of use, a Good mark for maneuverability and a Fair mark for safety. Lots of the disadvantages that the Combi Twin Sport had were addressed with this new Cosmo Twin. Bigger canopies, an included cup holder, better storage baskets. But storage space is a subjective thing… some parents think the baskets are big enough, and some think they are too small. Some reviews have praised the maneuverability, while one or two reviews have given complaints about squeaky wheels. Where can I buy the Combi Cosmo Twin? The first place I always like to check out is Amazon. They almost always have it for the same price as other merchants, or often times lower. If you have Prime and you choose the blue or black color, you will have your new stroller in a matter of days. Red is the other color choice, and is also the same price, just not offered by Prime at the time of this review. 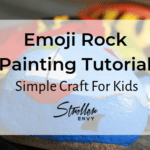 You might also try places like Target or BabiesRUs. Comparison shop and find your best deal. Buy your Combi Cosmo Twin today and imagine how much more convenient and enjoyable your outings will be once your new stroller arrives.